With the ski season fast approaching, C&IT picks out three of the best venues for a winter incentive. 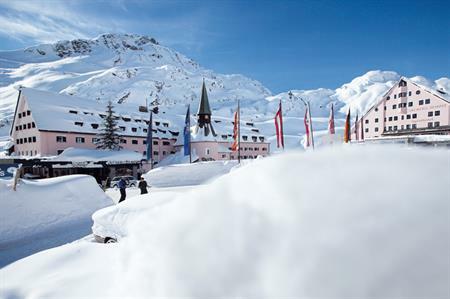 When it comes to skiing resorts, Austria is always a popular choice. Just a short hop from the UK, the country is ideal for a slope (or tumble) down the white stuff in the winter months. Guests seeking luxury should try out the alberg1800 Suites, part of the Arlberg Hospiz Hotel based in the popular skiing village of St Anton. Steam rooms, saunas and ice showers all feature within the suites, along with open fires, restaurant worthy kitchen appliances, Sonos music systems and one of the world’s largest big bottle wine cellars- ideal for tasting events. In addition to the nearby ski lifts, the venue’s concert hall can be used by visitors throughout the year. With five restaurants on site and a total of 23 suites, incentive groups have plenty of choice available. Bigger groups can also utilise the 87 rooms in the main hotel. Groups looking for an adventure further afield can try out The Moose Hotel & Suites, which have recently been launched in Banff National Park, Alberta, Canada. The quirky four-star property from the Banff Lodging Company features 174 rooms, offering spectacular views of the Rocky Mountains. Amenities include the Meadow Spa & Pools, which has ten treatment rooms and a private outdoor hot pool and the Rooftop Health Club, which offers two outdoor hot pools on the roof, as well as a bright indoor swimming pool, and a cosy sauna cabin overlooking the mountains. The area is home to three ski areas and natural hot springs, but the hotel can also be used in for summer for hiking and paddling. For smaller groups seeking a luxury break, catered chalet operator Meriski launched K2 at the end of last year, a super-chalet in the French resort of Méribel. By combining Chalet Kashmir and Chalet Kalliste, guests have access to 10 large double rooms in each chalet, spacious living areas and outdoor hot tubs with mountain views. Meriski’s chefs, who prepare food to 2 AA Rosette standard, will be on hand to serve dinner for the whole group. These luxury skiing breaks include breakfast and afternoon tea daily, sparkling wine and canapés and a four-course dinner on six nights, as well as all wine, beer and soft drinks, the services of chalet staff and the in-resort chauffeur service.